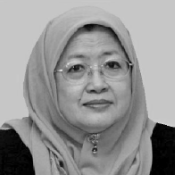 Dr Maimunah A. Hamid is a Professor, Community Medicine in School of Medicine, International Medical University Malaysia. She has served the Ministry of Health in Malaysia (MOH) for 33 years, gaining vast experiences at grass root level; working in hospital and health district settings, teaching, conducting research and leading a research institute, and policy making at national level as the Deputy Director-General of Health Malaysia (Research & Technical Support). She is one of the pioneers in the development of Health Systems Research and Quality Assurance Programme for the MOH in Malaysia. Her contribution led to the establishment of the Institute for Health Systems Research, which she headed from 2004-2008. The Institute was awarded a World Health Organization Collaborating Centre status for Health Systems Research and Quality Improvement during her leadership. Dr Maimunah has served in many national and international boards of directors and advisory groups, as well as a short-term consultant and technical adviser to national and international organisations, in particular the World Health Organization. She was a Board Member of the Alliance for Health Policy and Systems Research from 2011-2017. She attained her M. B., B. Ch from Cairo University, and Master of Public Health (M.P.H) from University Malaya, Malaysia. She was conferred Fellow of the Academy of Medicine Malaysia (FMM) and Fellow of Public Health Specialist (FPHS). She had completed courses on Health Care Evaluation and Management Skills in University of Toronto, Canada; and Health Care Quality in University Oklahoma, USA.